The Dragon’s Heart Guitar Pick: A Tool that Ignites Desire, Passion, and a New State of Mind. Throughout my journey as a guitarist, I have learned that the guitar pick is one of the most overlooked tools when it comes to building a rig. We guitar players often become obsessed with amps, effects pedals, strings, and other things and we essentially forget about the importance of our picks and, more specifically, what kind of picks we use. I, as well as many of us, have been guilty of thinking any pick will work for what I am doing. However, throughout my experience, I have found that the guitar pick really matters. A guitar pick not only changes the way it feels to play guitar but it also brings a new mindset to playing our beloved instrument. It can give a player a sense of assurance and confidence that leads to creativity and accomplishment or it can leave a player frustrated and, worst of all, with no desire to play. In my opinion, the latter should never occur. Playing the guitar should always be an experience that is invigorating, encouraging, entertaining, and, most of all, fun. So, after years of playing guitar, I began to explore the world of guitar picks to see what was out there. I wanted to find out if there were any noticeable differences between varying picks. Immediately, I found that the disparities were striking. Some picks made it easy to play while others seemed to be missing something. Sharp, round, thick, thin, et cetera; all the different characteristics of a pick not only affected how I played but also how I thought about playing. Some made me feel very confident and others made me feel like I was doing something wrong with my technique. Finally, after much trial and error, I came across the Jazz III. I thought the Jazz III was the perfect pick. It was thick, beveled, and it cut through the strings very easily. I used Jazz III’s for roughly four years before I came across the Dragon’s Heart Guitar Pick. I found about the Dragon’s Heart through a YouTube video by Rob Scallon. Rob put a link in the description of his video to the Dragon’s Heart website and I decided to give it a look. I examined the review page and saw where everyone was in love with the Dragon’s Heart. Then, I did further research and after being convinced that the pick was awesome I decided to purchase one of the Pure Dragon’s Heart picks. When I got it in the mail, it felt like Christmas. I ripped the envelop in half and immediately went to play. As soon as I hit the first note, I was wowed by the experience. All three edges of the pick felt incredible. I must have played for ten hours straight because of how amazing it felt to play with the Dragon’s Heart. After playing the whole day with my new Dragon’s Heart, the Jazz III felt unplayable. I literally could not, and I still cannot, use my Jazz III’s. The Dragon’s Heart is on another world. It makes your guitar feel like it is playing itself. For the longest time, it was extremely difficult for me to learn how to sweep pick. I have always been pretty good at shred and playing fast, albeit I mainly play Jazz, but sweep picking had eluded me for what seemed like forever. The Dragon’s Heart changed that very quickly. It does not cut through the strings like the Jazz III. It simply glides through them like butter. With it, I learned how to sweep pick with ease. It almost feels like cheating. It is so effortless to play anything with the Dragon’s Heart. Nowadays, I don’t leave the house without first grabbing my Dragon’s Heart pick. The Dragon’s Heart, by itself, gives me confidence in my playing that I never really had in the past. It inspires me to play and to be creative because new techniques, that were once hindered by other picks, are now at my disposal. It lights a passion within me every time I pick up my guitar. And most important of all it makes the instrument, that is already fun to play, even more fun. I feel that I deserve to receive Dragon’s Heart Guitar Picks for life because since I discovered the pick, I have been an ambassador for its expansion. I have recommended the Dragon’s Heart to many of my guitar playing friends and they have all jumped on board. I have attempted many times to get the Dragon’s Heart put into local guitar stores and music shops that are near my area. Additionally, I thoroughly love the Dragon’s Heart and I know for certain that I will use Dragon’s Heart Guitar Picks for the rest of my life. I have tried many other high-end picks and nothing can compare to the excellence that is the Dragon’s Heart Guitar Pick. Finally, I am a guitarist with a dream to be the best guitar player that I possibly can be and I know that the Dragon’s Heart will help me make this dream a reality. Thanks to the Dragon’s Heart, I have fallen in love with playing guitar all over again. It really is the best pick you can buy and I strongly encourage you to do so if you do not already have one. You will truly feel the difference after the very first note. 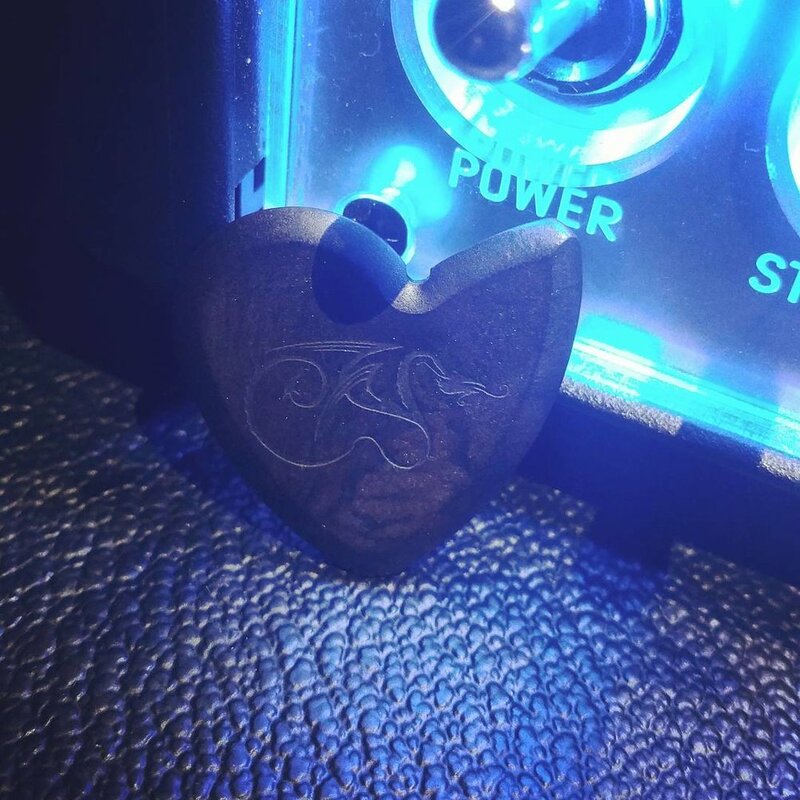 The Dragon’s Heart Guitar Pick is a tool that ignites desire, passion, and a new state of mind for all of those who are willing to seek new musical avenues and play with fire in their hearts. It all began about a year ago in July. I remember it very well, because it was my birthday. 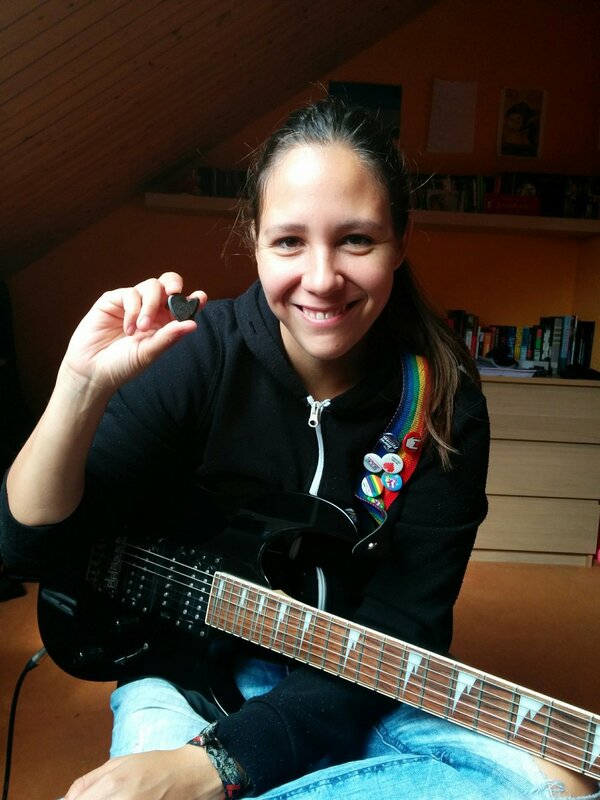 My band-mate and best friend Julian gave me a special birthday present: a hardened Dragon's Heart Guitar Pick. It was at that time, that I got to know Sophie. She was everything I could have wished for and more. With her, I started feeling more confident. With her, I felt like I could tackle anything, any difficulty in life. It's one year later and today I am sure about one thing: last year's birthday presents were the most precious presents I have ever received in life. I couldn't imagine my life without my girlfriend. She encourages me in every aspect of my life and she's never let me down. We are there for each other and we are always trying to be better women for each other. We love the TV show “Game of Thrones”, so our nickname for each other came naturally: “Khaleesi”. The mother of dragons. My queen. I know that my Khaleesi is the one person I want to spend the rest of my life with. And so is the pick. This special, wonderful and awesome Dragon's Heart Guitar Pick. Ever since I got it, I never even looked at any other pick. It felt natural in my hand, as if we were one. 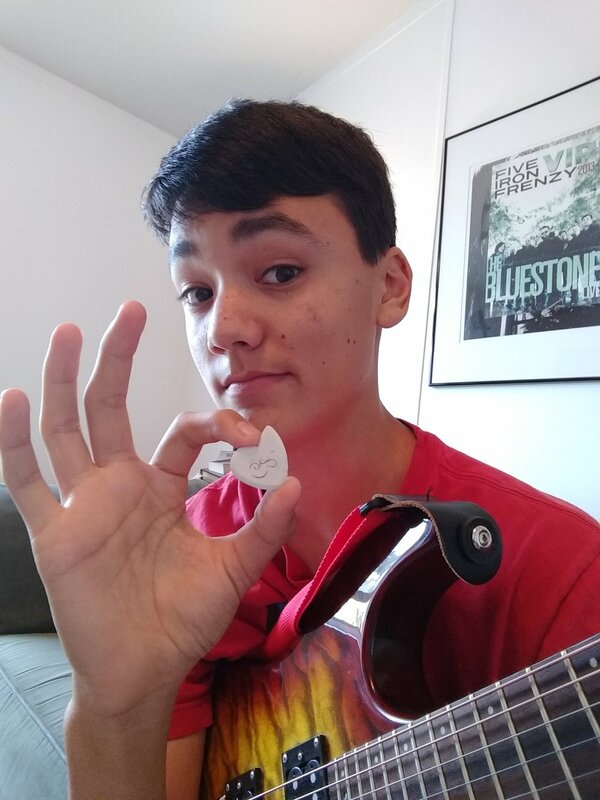 My guitar play improved enormously and I never had to bother about buying a new pick, because even after using it daily during the span of one whole year, it almost doesn't show. I was a bit intimidated by it's hardness, at first. But I've never been disappointed by its grip and ability to play. The sound created by it is breathtaking and so strong that every listener is amazed and thrilled. It's just like my love story with my girlfriend. I've never felt more comfortable playing guitar than today. This pick became my constant companion. Every day and every night I've been using it to play and become a better guitarist. For me and my band. It has become so precious to me that I always keep it safe and reassure myself constantly that I haven't lost it anywhere. My love is divided and my girlfriend and this pick, along with my music, share a special place in my heart. I feel fierce and invincible, just like a Khaleesi, the mother of dragons, should feel like. And this is why I deserve to receive Dragon's Heart Guitar Picks. For my love for music and life is the love only a dragon's heart can feel." So here it is, another #GPFL2017 ! I’ve been using DHGPs for almost 3 years now, so explaining why they are the best guitar picks won’t be hard. The shape is the first thing that catches the eye; 3 edges, 3 ways to pick your strings. Most of the time I use the regular edge to play rhythm and common licks. But if I want to cut through the mix for a crazy punchy riff (such as in Momento by Intervals around 0:30), I twist my pick to play with the sharp edge. When I attempt to play some guitar heroes sweeping parts, it’s just easier with the rounded side of the pick… but there’s at least one advantage to the shape I bet you didn’t see: at the deep between the rounded edge and the sharp one, it creates a V shape grip to lock the pick in your middle finger (at least that’s what I do). If I need to do some finger picking and have a pick in the same song, that’s perfect: by itself it beats every other pick on the market. Now let’s talk about longevity. They’re insane. I guess I could have been using the same pick all this time, if I didn't give some to friends at gigs, or even to my luthier to show to other customers. 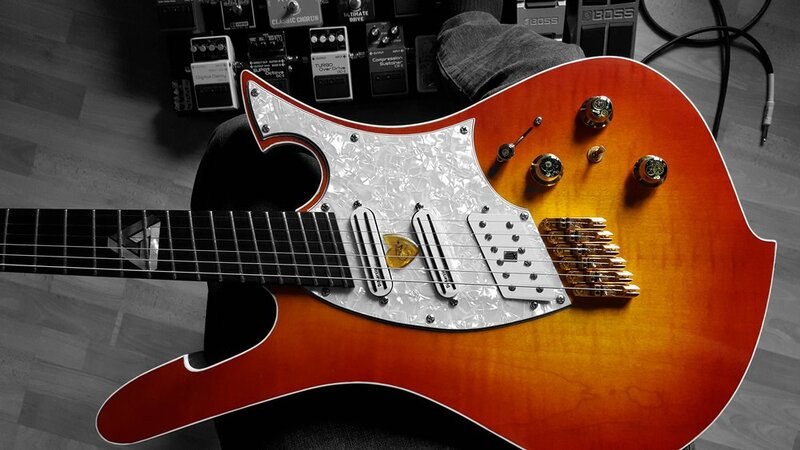 I jump between my engraved GT, my Pures, Hardened and Originals for my electric guitar depending on how I feel. However, I prefer having a thin pick when I play acoustic guitar to get a lighter strum, and I like it better as I play with light string gauge… But Corey from DHGP anticipated that with the Wyvern series, that’s what I use on acoustic. The Faux are the perfect middle ground, as they’ve the same thickness but are cheaper than the premium range, they’re the one I keep on every pocket of my jeans and ends in the washing machine; their colors never faded, made in U.S.A. confirmed! Lucas Laffineur, French Guitar Player. Being in a relationship with a hard working musician brings a lot of insight into how much actual practice is needed to get better and what can make the goals associated with that easier. My partner (who at the time of writing this has played guitar for 13 years) has suffered through the frustrations of trying to be a better musician and I have been there to witness it. Every day I saw him practice for hours upon hours with a metronome, repeating the exact same notes over and over only to hear him say that he is making no improvement in the speed of his playing and the technique. There were times when he would have to walk away from his instrument in anger and disbelief that no progress was happening no matter how hard he tried. In saying this I know him as a perfectionist when it comes to his instrument and he cares deeply about his technical ability. He is always pushing his limits. After several months of witnessing this with one particular guitar exercise he was trying to master, he mentioned to me over dinner that he thought it may be the type of guitar picks he was using, commenting that they always become blunt after one day of use and that this may be slowing down his progress as everyday when he went to practice something had changed. The guitar had stayed the same. The amplifier had stayed same. The picks always changed as they were being damaged through the extensive use. I suggested that he should buy more picks, however he stated that he couldn’t buy a new pick every single day. Looking back I definitely agree, that would be ridiculous! The next morning I woke up to him talking about a guitar pick he had saw online that wasn’t shaped like a regular guitar pick. “Does it last long?” I said to him, echoing the discussion the night before. “Apparently. It’s worth a try, I literally have nothing to lose at this point” he laughed, half at the disbelief that he hadn’t thought of this before and half at the idea of something so simple being such a big problem for his musical development. He shown me the website where he had seen the guitar pick. “Dragon's Heart Guitar Picks” he said reinforcing the idea of the purchase in his mind. “You have a birthday coming up, do you want me to buy that for you?” I asked. “Sure, I’ll definitely try it” he replied. The guitar pick was then ordered. I came home around thirty minutes later to him racing out of the music room with a metronome still playing in the background, a giant grin on his face. “I am five beats per minute faster on all my current exercises!” he exclaimed giving me a hug. After a short discussion he believed it was due to how the sharp end of the pick is designed, rather then being flat it curves to the point from either side, flowing off the guitar strings rather then pushing past them. “So you’re happy with your present then?” I questioned. This occurred three months ago at the time of writing this and I am happy to say he has not used another guitar pick since. In fact, he handed about ninety percent of his old guitar picks to one of his students and it seems that the rest are sitting around the house waiting for the day they get delivered to the bin. I would like to add that I am not a musician myself, or at least not a dedicated one. However seeing the confusion and frustration lift when my partner accomplishes something that had seemed as large to Mount Everest to him from a simple guitar pick change is proof in itself to me that Dragon's Heart Guitar Picks are the only thing he will never change with his guitar exercises and everyone else should at least try this if they are feeling their progress slow down. He will often brag to me about how “The pick hasn’t had any problems!” or “I can’t believe this one is still going!” whilst showing me how there hasn’t been the slightest amount of damage on any of the three unique sides he uses for different styles. Now when he practices I see him use the same guitar, the same amplifier and always the same guitar pick. 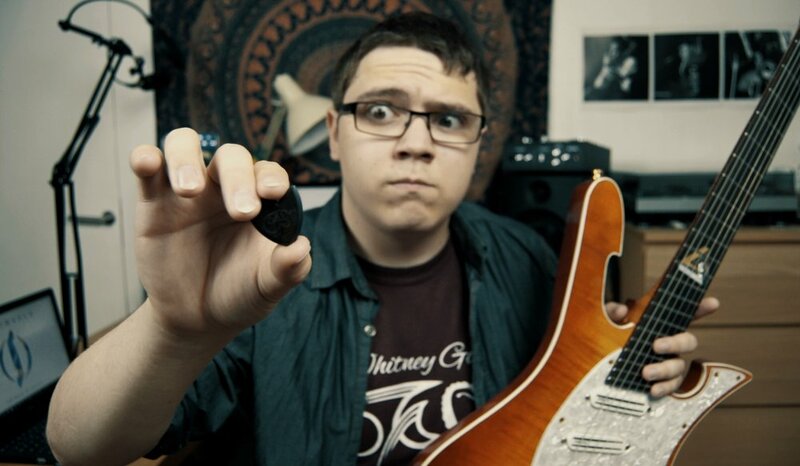 Seeing Dragon's Heart Guitar Picks place a competition for a lifetime of guitar picks seemed like this is exactly what he needs; once I saw this on Facebook I knew I had to write an entry in hopes of surprising him if I were to win. It’s an opportunity that cannot be missed with this fantastic company who obviously care about their customers. Regardless of the outcome of #GPFL2017 (Guitar Picks For Life 2017) I know he will continue to play with fire in his heart while using these amazing guitar picks! I’ve been on a quest to find the ultimate guitar pick for the better part of the last 10 years. I finally found it last year when I bought my first Dragon’s Heart Guitar Pick. I’ve tried just about every type of guitar pick on the market, and even experimented with making my own picks from antler, bone, and exotic woods. I learned a lot about how much influence the pick’s shape, material, and thickness can have on how a guitar plays and sounds. I didn’t realize what I was missing until I tried a Dragon's Heart pick. It is THE best guitar pick I’ve ever used. It is the first pick that actually improved my playing. Of course, practice is what makes us better, but the Dragon’s Heart pick doesn’t inhibit my playing or creativity. Fast arpeggio runs that I was fighting to consistently nail, were much easier once I started using my Dragon’s Heart. I adore the way the pick looks and feels. Other musicians often ask about the cool looking shape, color, and the dragon etched on the pick. The aerospace-grade polyamide material seems to last forever. I have a heavy hand, and tend to wear out other picks quickly. The first thing to go is usually the bevel, but the bevel my Dragon’s Heart pick is still solid. 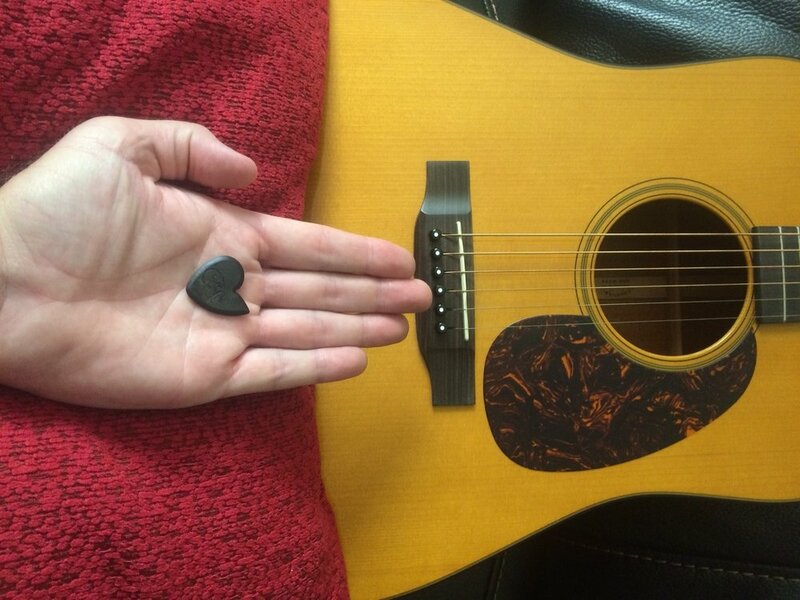 The pick is the perfect size and allows me to play longer without any hand cramping. With other picks, I was always doing weird modifications like gluing on sand or velcro, or drilling holes so that it would have better grip. The Dragon’s Heart doesn’t need any modifications. It has a terrific grip that doesn’t slip, even when I’m woodshedding and sweating in my painfully hot garage. I also love that the pick has three picking edges. I typically use the standard edge, but the other two are nice to have because they offer a very different feel and sound. Many guitar players won’t hesitate spending huge amounts of money on upgrading their pickups, guitar electronics, cables, tubes, or yet another variation of their tube screamer. But among this pantheon of guitar tone upgrades, the guitar pick is all too often the last one to be considered. Aside from guitar lessons, I honestly believe in terms of a cost-benefit ratio, the long-lasting, high-quality Dragon’s Heart pick is the best investment I’ve ever made in terms of upgrading my tone and playing ability. Everyone deserves awesome tone. 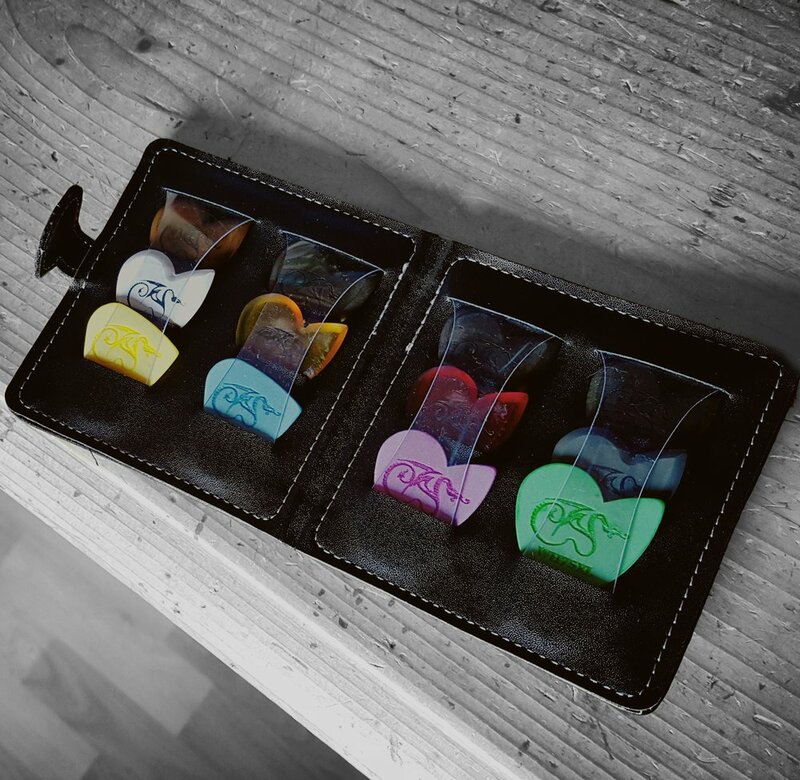 A lifetime supply of Dragon’s Heart picks would help me on my never ending journey to have the best possible guitar tone, and to spread the word about these epic picks. As a passionate guitar player I love gear that improves my playing experience. Therefore, I am constantly drooling over high end amplifiers, guitars, pickups, pedals, and etc of which I can almost never afford. However, about four years ago I used one of my uncle’s higher end pick and realized that picks are severely underestimated when it comes to guitar gear. One can imagine what came next. I went to guitar center and bought all the different types of picks to find the one for me; however, while each had at least one good perk, there was no outstanding pick that did it all. Afterwards, I turned to the internet only to be overwhelmed by the vast selection of picks made of new and interesting materials and shapes. I bought many of those strange picks each claiming to be the best in the world, but they would either break too quickly, be too hard to use, or not be any better than the average twenty cent pick. Finally, I bought a few Dragon’s Heart picks. They came in the mail a few days later and I was amazed at how they improved my playing in terms of tone and technique. Since then I have used them almost exclusively. They hit all of the requirements of a great pick including quality and playability. The quality of the Dragon’s Heart picks was quite astounding when I compared them to standard picks. They are primarily made out from Polyamide-Imide and therefore are extremely durable and strong, so strong; in fact, that one would have to try hard to even scratch them. It is no wonder they last so long. In addition to their strength, Dragon’s Heart picks are very unique in their shape and design. They have three distinct points that each provide a different tonality. For example, the sharp point produces a bright clear tone, the semicircular point makes a warm soft tone, and the normal one is the middle ground. In addition to the special shape, Dragon’s Heart guitar picks also have a bevel along the edge of them. This is one of the key aspects of their design. The bevel provides enhanced playability that really brings the pick’s functionality to new heights. The playability and functionality of these oddly shaped picks is the primary reason they are the best picks around. When I first held a Dragon’s Heart pick I thought “this is not flexible enough, I will never be able to strum well with it.” However, it ironically feels more natural to strum with them than a supple pick. At almost any angle or velocity these picks glide smoothly over the strings giving them a more natural sound than the snappy thin picks. Furthermore, the rigidity of the picks creates a very easy picking experience. They pluck the strings with more accuracy than to any other guitar pick. When using the dragons heart picks on a solo, arpeggio, or any other picking one gets a great level of control that makes playing more precise and fun. Therefore, the range of styles one can play with Dragon’s heart picks is vast. 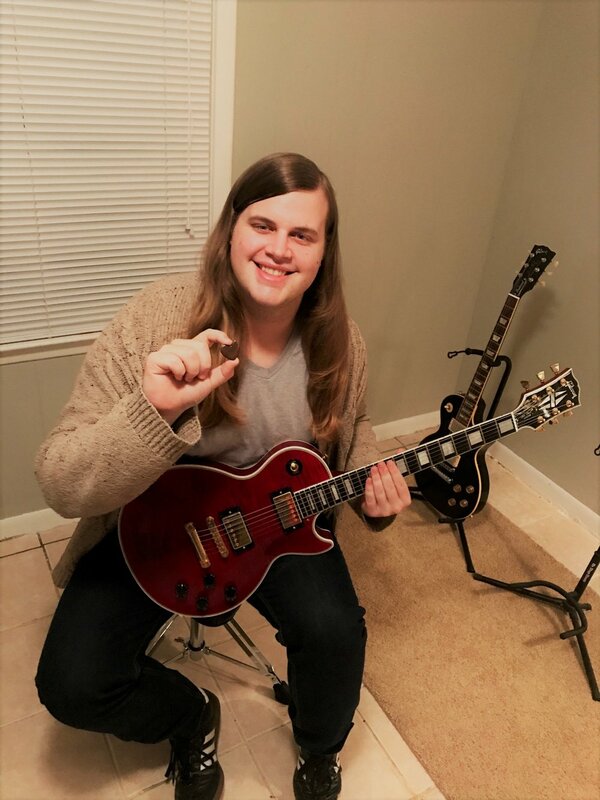 I have played everything including rock, metal, jazz, blues, classical, and funk on both the acoustic and electric guitar without even having to think about how to use my pick. This has really helped me excel on the good ol’ six string. All of these awesome properties of the dragon heart guitar picks are why I would use them for life. I have been playing for five years now and using dragon’s heart picks for most of those years. I have no plan on using any different pick. 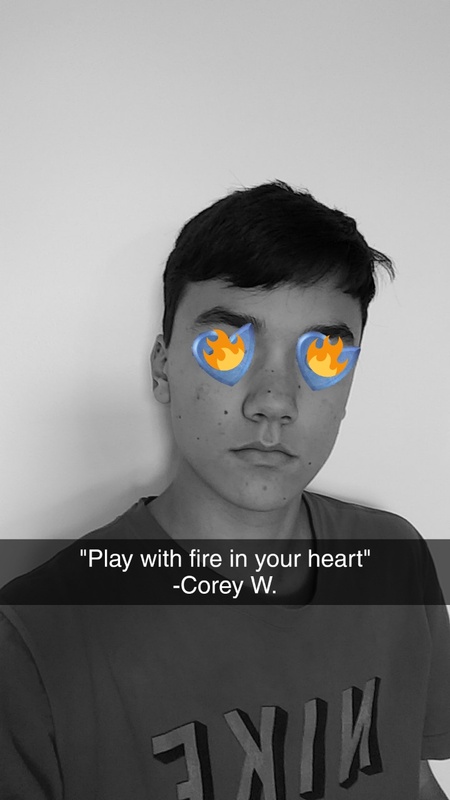 I think that I would be a good choice to win because aside from being a committed user of the dragon’s heart picks I also love to let others know about them. For example, out of the six picks that I purchased I have given away four to other people who enjoyed them. The reason for this is that I want other players to be able to improve their playing experience just like I have. Some players did not want to leave their old picks behind, but others where as thrilled as I was. 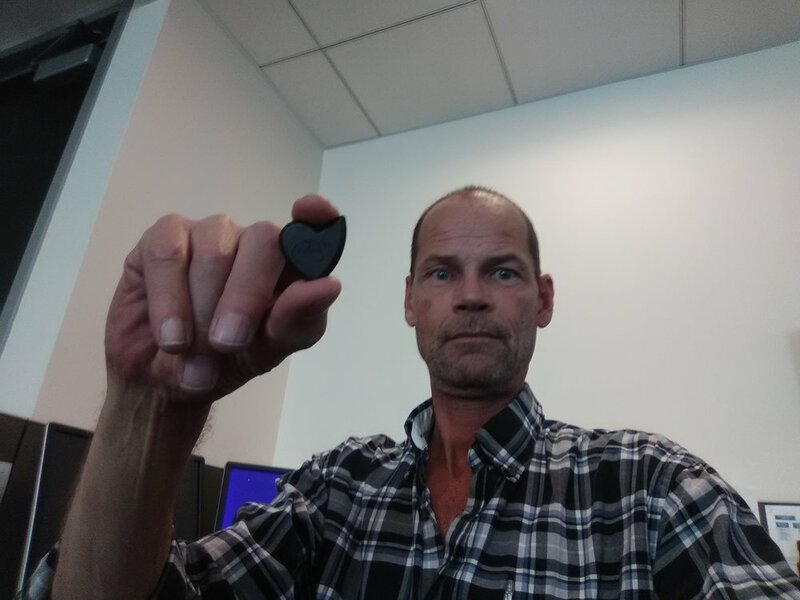 For example, both of my younger brothers, my bands rhythm guitarist, and my closest friend all are now using Dragon’s Heart picks as their go-to pick. Furthermore, if I had a lifetime supply of Dragon’s Heart picks I would be able to get more people to try them out and hopefully get them to use the picks as well. Some of these people include the kids in my schools music club and my church youth worship team who I have not lent out picks to yet because I don’t want to lose any more of my own. In conclusion, the quality and playability that dragon’s heart picks embody truly make them the best guitar pick around. Therefore, I am glad that I have had another chance to advocate for them during this competition. Not many other companies have these kinds of engaging contests with such great prizes. Finally, I would like to say congrats to the winner and thank you to Dragon’s Heart Guitar Picks for your quality products. #GPFL2017 These Plectrums Are Flipping Fantastic! I have been using Dragons Heart Guitar Picks for over a year now and I absolutely love them. They offer a wide range of thicknesses, colors and couple different styles to fit any players needs or style. They also offer custom engraving for that personalized touch to your guitar pick. This is important to me, because if your friends try one of these picks you may not get your plectrum back. 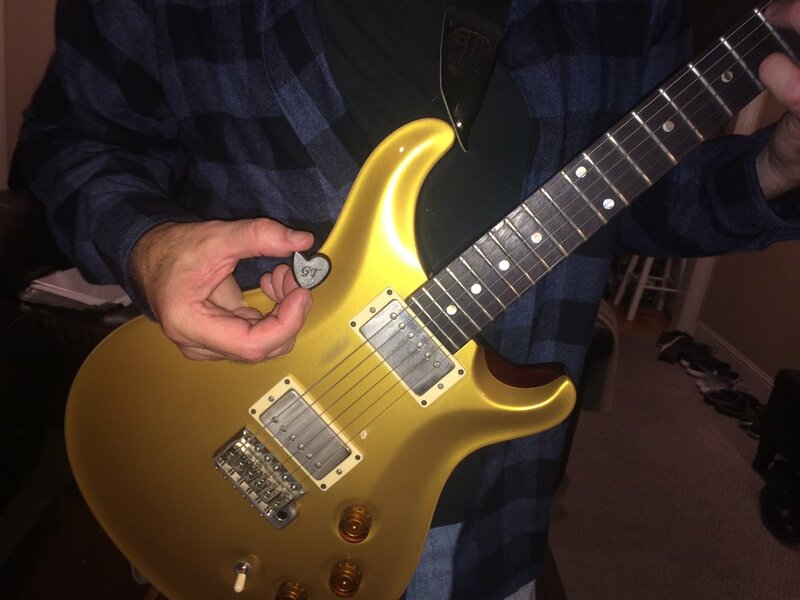 But with the personalized engraving there will be no doubt who owns that pick. Then there is the company logo which comes on one of the sides of the plectrum, which I think looks awesome itself. I have always liked Dragon themed items and this representation of a dragon is spot on to me. I particularly enjoy the strap mounted guitar pick holder. It insures me that I will always have a Dragons Heart Guitar pick with my guitar, and I never have to go hunting for it (or check the dryer, couch cushions, or the kids toy box lol). Oh and let us not forget their T-Shirts, If I won this years contest, I could stock up on some of the awesome T-Shirts as well. 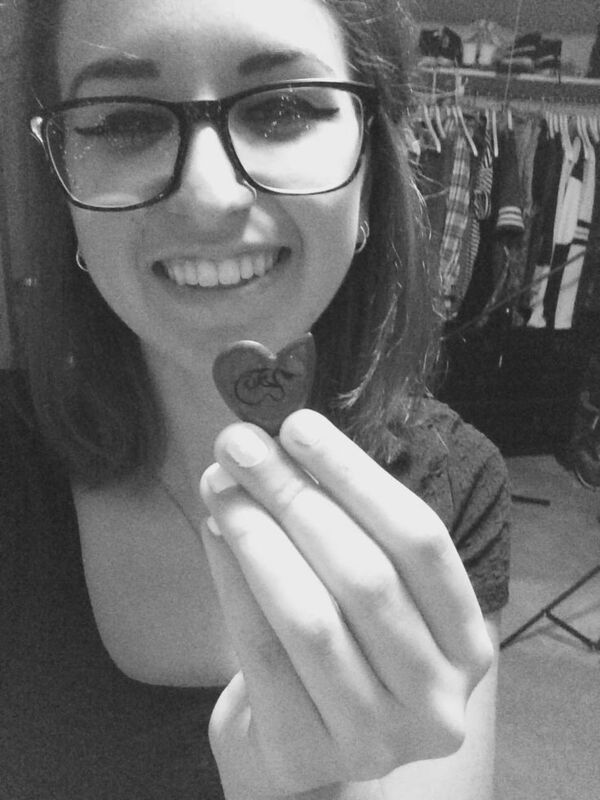 Hi my name is Adriana and Dragon's Heart picks are my absolute favorite. I've used them for two years and I'm so pleased to have them in my guitar tool box. For so long I held the idea that certain compromises needed to be made for pick selection. Maybe the fastest playing pick isn't the best pick for strumming and vice versa. Maybe the best sounding pick isn't necessarily the the most comfortable. That's why I'd have a pick for every situation. One for recording, one for playing live, and one for strumming alone. But when I discovered Dragon's Heart picks, I realized that I don't need to make those compromises. It was my all in one complete package. 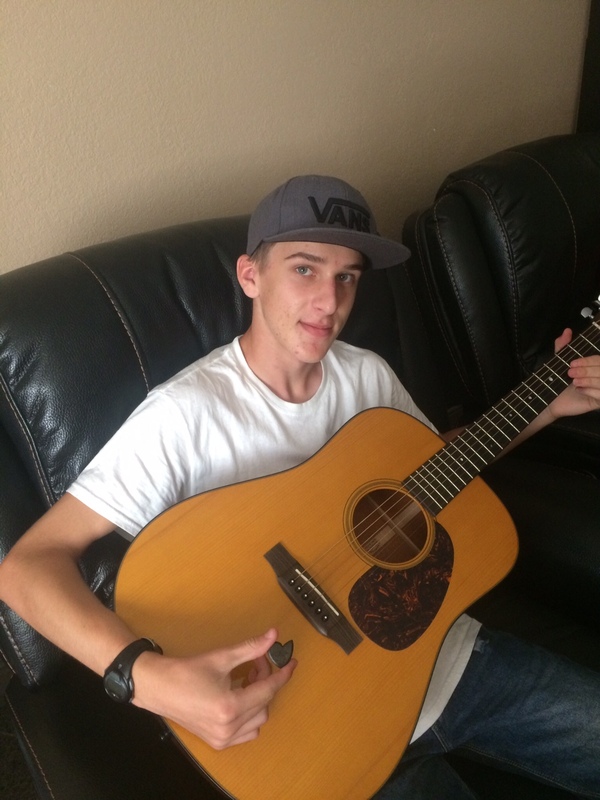 I found a pick that sounded better and played better than anything. At first glance I thought "But it's gotta be uncomfortable to play. It's shape isn't normal." But to my surprise, it felt incredible to play. It even had an amazing grip to it. I never once dropped it while playing. I was so impressed by the sound that I even did a test with my friends and family where they picked the best sounding pick without looking. And the Dragon's Hearts were easily the favorite among both my musician friends and casual music listening family. That alone would've made them my number one pick but the fact that they were also comfortable and playable made it a no brainer. These were the highest quality picks I've ever come across. I think I deserve to win this contest because I was searching for a perfect pick for so long and my journey included all of the other premium picks out there. I've put in a lot of time to find and compare picks so that I could find the best picks out there and DH picks are the absolute best. And while some of the other premium picks out there were nice in some respects, none of them met the criteria of what I would call a perfect pick. I tried everything from high quality acrylic picks to stone and everything in between. If one was good for speed, it would slip out of my fingers because of how sweat reacts with acrylic. Others had great grip but was not good for strumming. But DH picks gave me a solution for everything and I'm so thankful that I found them. It's like the swiss army knife of picks due to its multiple tipped design. And on top of all of that, it's just a gorgeous looking pick that I love to show people because of it's craftsmanship. Get these picks because you'll never go back to your old ones! Hi! First of all, I want to say that these picks are the best I’ve tried so far! Even if I don’t win anything I wanna wish the Dragon’s Heart team my best wishes! Keep up the good work! So, my name is Marco “Mark” Henriques. I'm a 19 year old Portuguese guitar and bass player and I've been using these picks religiously for over a year now. I was around 12 years old when I started playing and since then I've tried all sorts of different brands, shapes, thicknesses and sizes; but after awhile there were always things that made me go like: "Meh... I don't think this the one for me..."; all except... you guessed it! Dragon's Heart! Somewhere along the way I either saw CSGuitars' or Rob Scallon's video about Dragon's Heart picks, don't remember now whose video I saw first, but it intrigued me. Later on I saw more and more people like Robert Baker using these weird picks so I had to give it a chance! I ordered two picks and only one arrived... I sent the guys an email and they were really sorry and sent me two! No costs attached! Let's be honest, no all companies would do that! But back to the picks now! The coolest part about these picks is that even though these are some very thick and oddly shaped plectrums there was no adaptation period! They are great from the get go! I started out using the Original Dragon's Heart, and am now using the Hardened picks for guitar and the Wyvern's Heart for bass. If by any means you still don't believe that these are the best picks I've tried; since I live in Portugal and I can only get these picks from the US, I have to pay between 30-40% of what I spent at the customs to import from out of the European Union. But hey! They're so good that I find them worth the extra money. Also I pick very aggressively and the pick dust shedded by the pick into the strings colors my fingers! (check picture attached) Nothing that a couple of baby wipes can't take care of! All for these amazing picks that have an amazing grip, look great, feel great, sound great and last a long time! As you know, many things made in the good ole us of a are the best and of top quality. It certainly applies here in the land of Austin city limits et al. Ye know? I pray so. Dragon's Lair picks are the best also because of the attitude and art Corey brings to the table. As with most things in life , Attitude is All. Be it winning a World Series, or playing a guitar. Or singing a song ( say the national anthem to open a World series game!). I love playing with the best stuff. My axe is a Taylor. Excellent sound and better than a Taylor not made in the USA. Mine is made in California. Many today are made in Mexico. Now the Mexican can make a good axe. But I've compared the sound to the USA -made Big Baby and usa kicks it into the sand as far as SOUND. She just does. Now which pick do you feel creates a better sound: one made in the USA.Or one made elsewhere? Uh-huh. I agree: USA made just sounds better. That , then , is the bottom line. Thank you for LISTENING! And Hsppy Pickin' !